Disclosure: This post contains affiliate links meaning I earn a small commission if you click on a link and make a purchase. 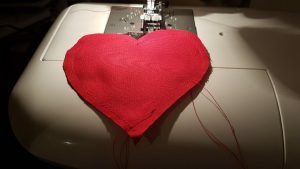 This comes at no additional cost to you and helps me keep SewingBeginner running. Christmas is just around the corner! I love that time of the year. London lights up in the most beautiful Christmas decoration and a peaceful atmosphere spreads over the otherwise hectic city. It’s time to reflect upon the past year and think about plans for the new year. 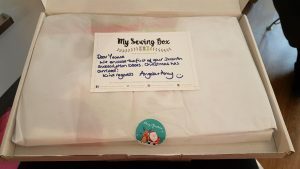 That’s why I was all the more happy that the first My Sewing Box I received was all about Christmas. 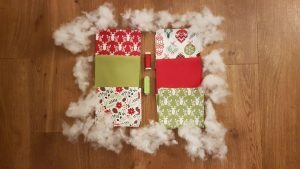 The beautifully packaged parcel included 6 festive fabrics, a green ribbon, and a matching red thread. Now, it was time to bring my own creativity to life and think about what to make out of this lovely box. 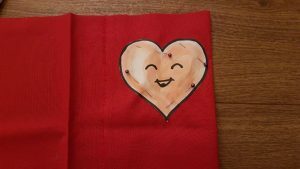 Pin your pattern, let’s say the heart, on to the folded fabric and cut it out. This gives you two symmetric pieces. Sew the pieces right sides together. Right sides together mean that the printed sides of the fabric are facing each other. Keep in mind to reverse your stitches at the beginning and the end. Important: don’t sew all the way around it but leave a little gap for the next step. 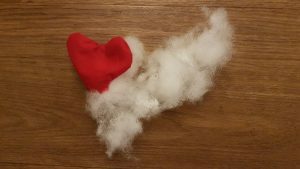 Turn your fabric inside out and fill it with toy or cushion stuffing. Carefully hand sew the opening together. 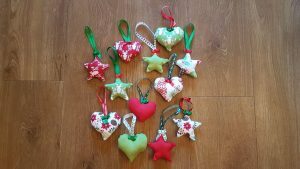 I can’t wait to decorate the Christmas tree with my handmade ornaments while listening to some cheesy Christmas music and having a cup of comforting tea. Hope you enjoy this sewing project as well – there are no limits to your imagination especially in the decoration part!